Image Size: 21-1/4 x 22-1/2"
Framed Size: 32-1/2 x 34"
Free shipping for the original painting. When the artist was creating this watercolor painting, she said it reminded her of a ballerina dancing. 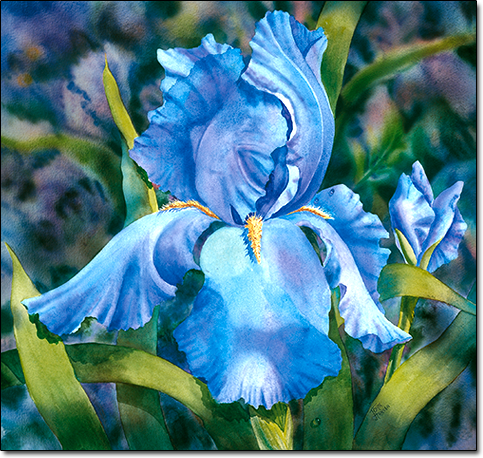 Each petal was painted with a harmonic blend of blues, aquas and mauves. The same tones were repeated in deeper values on the turns and folds in the petals. The background was air brushed which gives muted soft transitions of color, bringing your eye back to the center of interest. This painting is available in two formats: the original painting and limited edition giclée prints. The original painting has been framed with a custom moulding and linen liner. There are 200 signed and numbered and 40 artist's proofs in the edition. When you make your selection, click on the Add to Cart button to finish your purchase.